If you’re like me, you love rich, decadent, chocolate desserts! 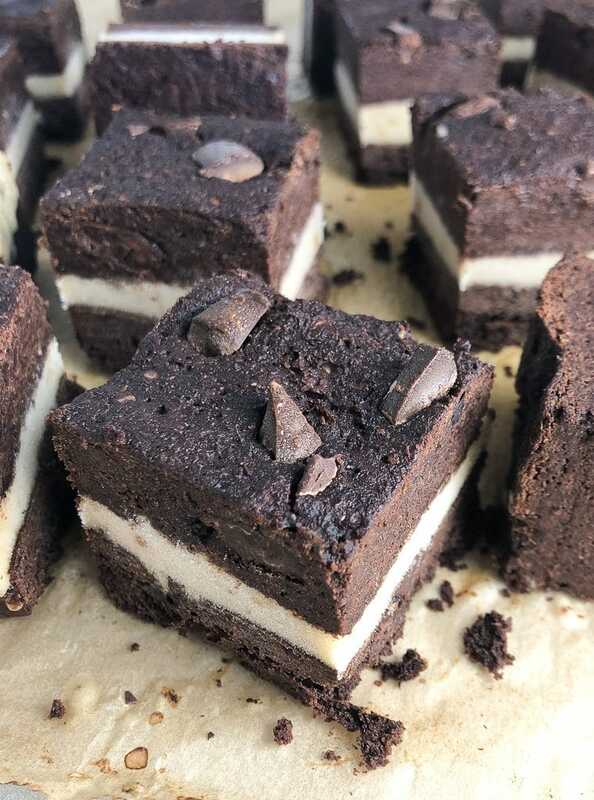 These Brownie Ice Cream Cake Bites will satisfy those chocolate cravings all while being dairy-free, gluten-free and free of refined sugars. They’re also full of plant protein, and can be made nut-free if needed. You’re doing your body a favor by eating one! I wanted a healthy ice cream cake for my birthday and that’s how these chocolaty bites of heaven came about. 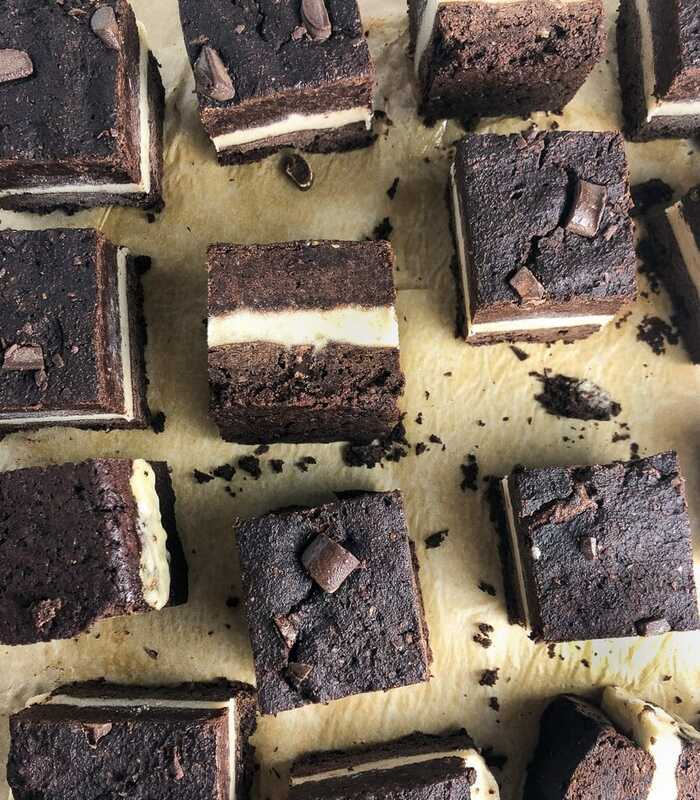 For birthdays in our house I usually make chocolate cupcakes, but lately I’ve really been loving these brownies so I thought, why not make an ice cream cake out of those. The best part is the brownies are even healthier than the cupcakes, but taste just as good! To keep the ice cream part healthy I made nice cream. If you haven’t tried nice cream yet, put it on a to-do list asap! It’s so yummy, and so much healthier than regular ice cream because it’s only sweetened with fruit and no dairy! I made skinny ice cream cookie sandwiches with it before, so I new the concept would work and be delish! The body does not process fruit sugar like regular sugar, it does not make you fat! The number one dietary risk factor is now not eating enough fruit. We need fruit sugar for optimal health. The first thing that needs to be done is to freeze some bananas. A big error that’s made a lot is eating bananas before they are ready. They should not be eaten right after you bring them home from the grocery store, especially when they are still green, or yellow and rock hard. Bananas should have lots of brown spots on the outside. Giving them time to fully ripen before they are eaten will allow your body to properly digest them. There’s been rumors that bananas can cause bloating and/or constipation, but this doesn’t happen when they are consumed at the right time. Since my son eats bananas every single day (and he has no issues with constipation!) I buy bananas in bulk. When I get them home, I break them individually from their bunch and put them in brown paper bags. I usually put 3-4 in a bag depending on the size. Once they’re covered with brown spots they are ready to freeze for nice cream. Make sure to peel the bananas before freezing them! I usually break the banana up into two to three pieces before putting them in a freezer friendly bag. They can also be placed on a baking sheet lined with parchment paper to freeze as well. Bananas need to be in the freezer for a least 2 to 3 hours. For best results let them freeze overnight. Once the bananas are frozen, place them in a food processor or high speed blender and blend away. If the bananas start to stick too much, add in a few splashes of non-dairy milk to help them blend better. Water would also work. Bananas are the only ingredient needed to make the nice cream, but it can also be flavored with one to two teaspoons of vanilla extract, and/or a few dates to give it more of a vanilla taste. Before it’s blended, have both batches of brownies made because the nice cream needs to be transferred on to them right after blending. You could wait and freeze it, but I find it’s harder to work with that way. Do NOT cut the brownies before you put the cake together. Here’s how I assemble it. I leave one of the brownie batches in the 9 x9 pan. I use a spatula to spread the nice cream all over the top of it. Then I carefully set the other batch of brownies on top of the nice cream. After that, I put it in the freezer so it can mold together. I usually leave it overnight, but it should be ready after 2-3 hours. 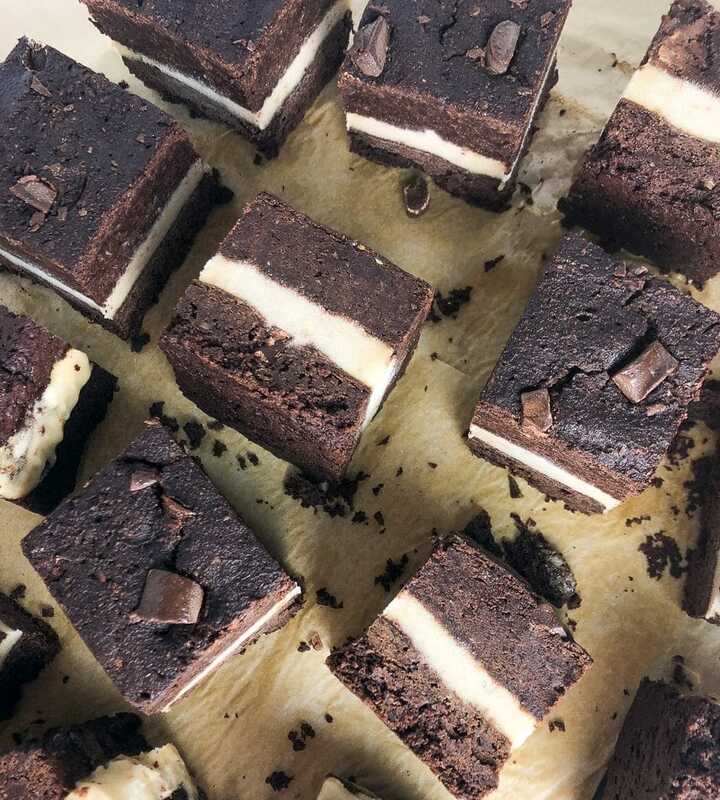 Once the cake is frozen, I cut rows like traditional brownies, but it can be cut however you like. This dessert will keep you healthy, and I hope it brings some happiness to all who try it! Have you made this dessert? What do you think of nice cream? I’d love to hear your thoughts below. You'll need to make two batches of these brownies. First, freeze your bananas either overnight or for at least 3 hours. Make sure to peel them before freezing and either put them in a freezer safe bag or just on a pan lined with parchment paper. Once bananas are frozen, add all the ingredients to a high speed blender or food processor. Blend until smooth and creamy. Leave one of the brownie batches in the pan. Using a spatula, evenly spread the nice cream over the top of the brownie. Carefully place the other brownie batch on top of the nice cream. Place in freezer for at least 2 to 3 hours, or overnight. 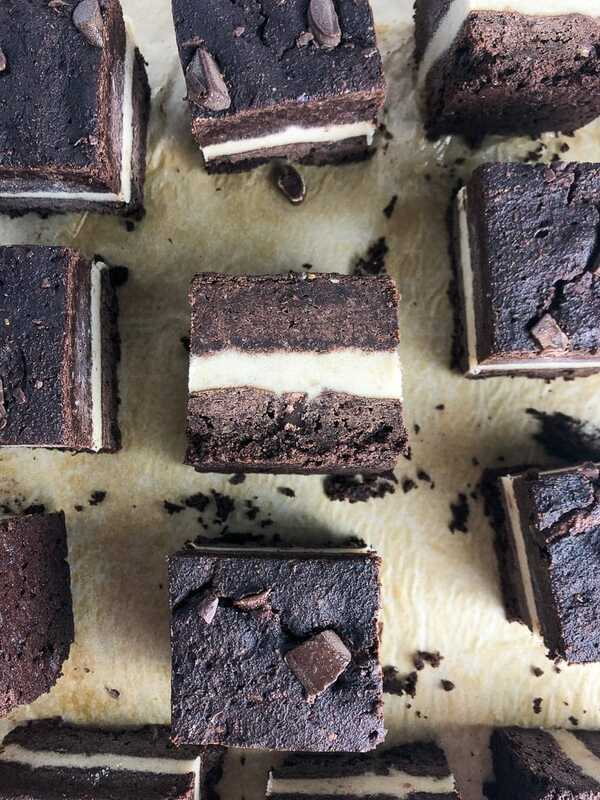 Once the cake is frozen together, cut into brownie bites. You will need a sharp knife to cut. Store them in the freezer. Serve when ready to eat as they will melt. Read the blog post for more tips and details on making this dessert. A food processor or high speed blender works best for the nice cream. A splash of non-dairy milk might be needed to help the nice cream blend better. Water would work, too. If the nice cream is too creamy, let it sit in the freezer for 15-20 minutes to firm up just a bit. You don't want it too frozen or too creamy because it will be hard to assemble. it looks easy to prepare and ready to eat. I will surely try this.